WASHINGTON, D.C.—Several aides sat Representative Alexandria Ocasio-Cortez down Monday to show to her how her radical, socialist tax plans simply don’t add up, explaining how she needs to make radical changes if she’s going to make any headway implementing her policies. 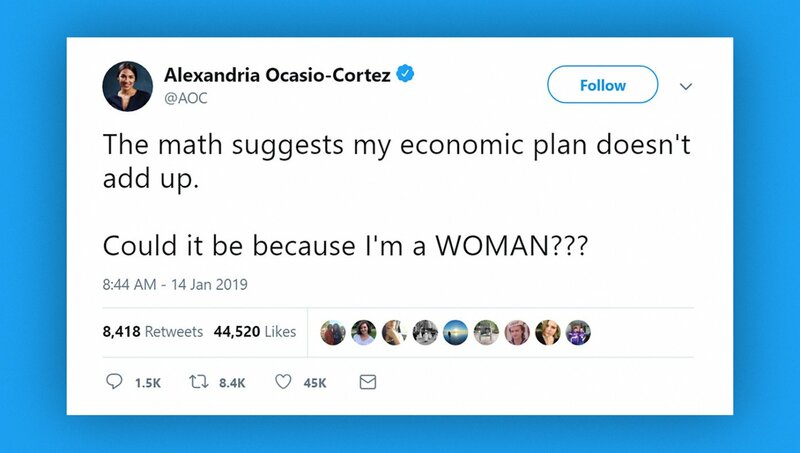 In response to the cold, hard numbers that shredded her economic plans, Ocasio-Cortez pointed out that she was being unfairly targeted by objective facts because she’s a woman and a minority. Go here to read the rest. This would be funnier, if she wasn’t proposing 40 trillion dollars in spending with absolutely no realistic plans as to how to raise the money. Socialist Nerd Barbie is a joke, but due to identity politics, I wouldn’t bet against a Democrat Congress and a Democrat President not going along with this step off a very steep economic cliff. Representative Alexandria Ocasio-Cortez is the best thing to happen in politics since Donald Trump. She is just perfect for the job. The job of showing the idiocy of Democrat thinking but who does it in a humorous way, so her clips can be used without seeming too offensive. Alexandria a godsend. The problem with Alexandria Ocasio-cortez is that a significant fraction of our ignorant population believes and idolizes her. I hope Michael Dowd is correct, but I think she is dangerous. Another Eva Peron, but a really stupid one. Karl Marx: Hegel remarks somewhere that all great world-historic facts and personages appear, so to speak, twice. He forgot to add: the first time as tragedy, the second time as farce. There never seems to be a shortage of fish taco carts and nice folks who love peddling seven day old tacos. Good fare for the Dems. It’s not their fault. They went to public schools. but due to identity politics, I wouldn’t bet against a Democrat Congress and a Democrat President not going along with this step off a very steep economic cliff. You’re already out of date. Oh wait! You meant the plan for the budget, not the “math is sexist” meme – right? Do you even know any more? – Binary math is “transphobic”, and will have a person believing that we’re a binary species. – Octal math will have male engineers dreaming of women with hour glass (8) figures. – Decimal will lead to the Ten Commandments and praying the Rosary. – And Hexadecimal is the embodiment of all three!